Whether you love the winter months or hate them, they're often a perfect time to settle in with some embroidery. 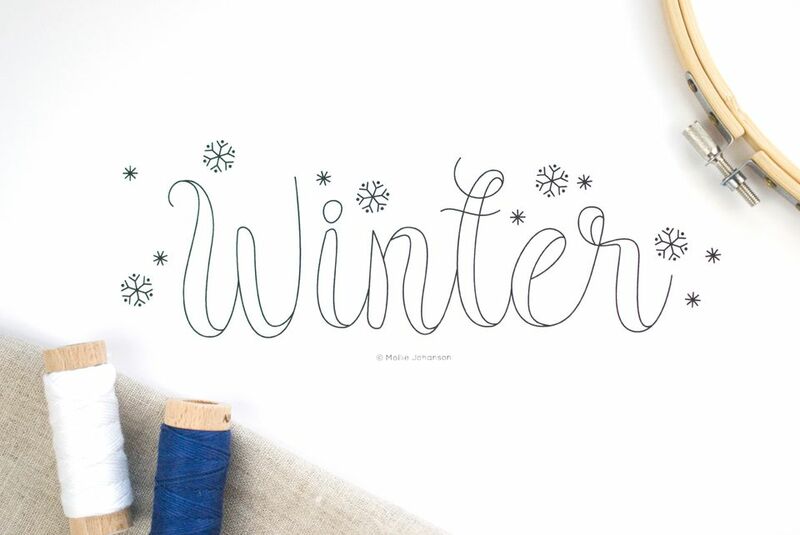 And this typographic winter embroidery pattern is a good project to start on as you curl up by the fire with some hot cocoa and your stitching. The design uses five suggested stitches, making it suitable for beginners who have a few stitches mastered, but you can simplify it if you only know a few stitches. This pattern is the second design in an ongoing series of seasonal word art patterns, which started with a matching autumn embroidery pattern. Use the set of patterns to embroider kitchen towels, hoop art or changeable pillow covers for your sofa. To use this pattern, download the JPG file. Setting the image to print on a standard piece of paper in "landscape mode" is a good size, though you can adjust it. Bear in mind that this pattern has some small details that may get lost if you shrink it too much. Print out the pattern on standard paper and then use your favorite marking method to transfer the design onto your fabric. If you're working on dark fabric, water-soluble stabilizer is an excellent material for easily marking a pattern. Note: This pattern is copyrighted by Mollie Johanson. You may use it for both personal and cottage-industry projects, but the pattern may not be resold. Any wintery colors will work for this design, though the color of the fabric you use will help determine some thread color choices. For example, if you use white fabric and want the snowflakes to show up well, they should be stitched with light gray, light blue, or silver. This design would also look beautiful stitched entirely in white embroidery floss on a dark blue or gray fabric. Embroider the word "winter" with a combination of back stitch (for the thin lines) and satin stitch (to fill in the thick areas). For a more open look, embroider the outlines of the letters with back stitch. Then use straight stitch to make horizontal or diagonal lines within the wide areas, keeping the stitches about 1/16" apart and evenly spaced. Or, stitch only the outlines with your favorite outlining stitch. Work the large snowflakes with fly stitch and french knots, and the small snowflakes with star stitch. If you want to work the winter pattern at a smaller size, you may need to change the look of the snowflakes. Instead of stitching the larger detailed snowflakes as shown, work them as the star stitch flakes. Then, in place of the star stitch snowflakes, work individual french knots. This pattern would look great with a bit of sparkle. Consider adding some beads or sequins to the snowflakes or in addition to the embroidered snow! Metallic threads are another good way to make your embroidery shine! Enjoy your newest winter embroidery project!